Location: San Pedro de Atacama, Chile. 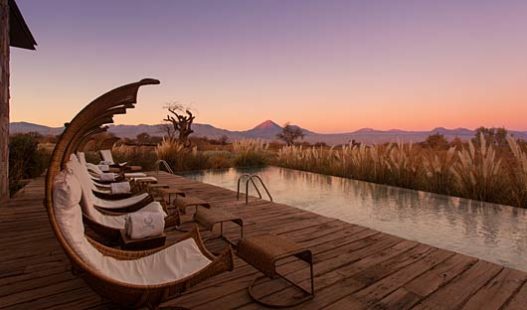 An unforgettable backdrop sets the scene for guests at Tierra Atacama Luxury Accommodation. Incredible views of volcanoes against the skyline can be seen from the lounge, restaurant pool and spa. Boasting a modern neo-minimalist design with dark wood and stone this hotel perfectly complements its surroundings allowing guests to enjoy the natural wonders of the Atacama Desert whist providing indoor comfort and exceptional service. 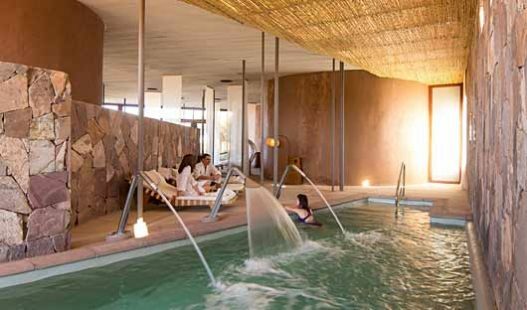 Relaxation areas are complemented by a full spa as well as an indoor and outdoor pool, Jacuzzi and saunas. 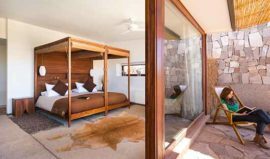 The rooms are informal yet stylish and each has its own private terrace with a view of Licancabar volcano and family suites have an upstairs terrace with garden views. 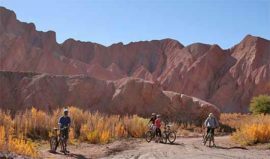 Tierra Atacama offers excursions for all fitness levels and interests. There is a vast choice depending on your tastes including: walking, hiking, climbing, horse riding, cycling, exploration by van and stargazing. View excursions here. 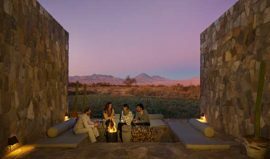 Tierra Atacama employs passionate local guides with many years of experience and contagious enthusiasm for their surroundings. 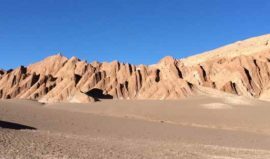 The guides take pride in showing off all the Atacama Desert has to offer. 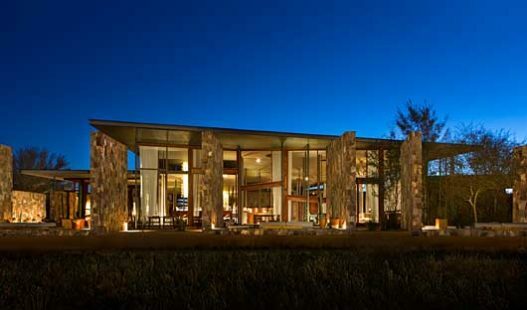 Tierra Atacama welcome visitors from all over the world who enjoy travel and discovering new places and cultures. The many common areas are a perfect for enjoying the company of like-minded travellers and well as the views of the unique landscape. 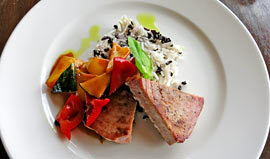 Tierra Atacama sources local produce to create delicious meals highlighting local cuisine. This ensures local farmers and businesses benefit from tourism and your meals are as fresh as they can be. 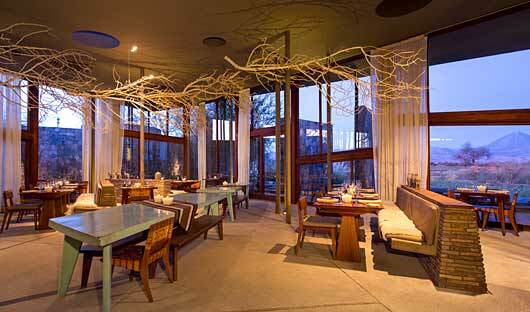 Tierra Atacama’s interior design, architecture and gardens create a casual and friendly ambiance . 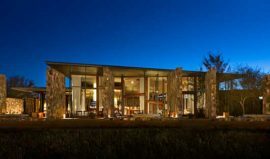 Guests can relax in well planned living spaces including lounges and outdoor areas with fire pits to enjoy the star filled night sky, perfect place to retire after a day of exploration. Oriente Rooms offer romantic settings for guests. 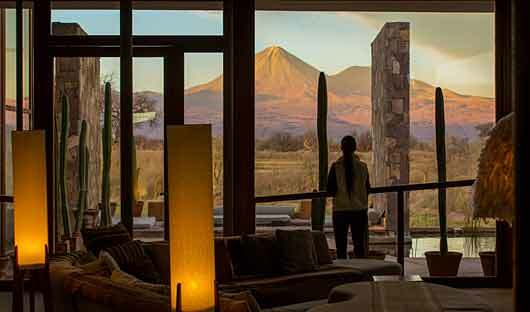 Views of the Licancabur volcano are seen through the sliding glass doors that lead to a private terrace. 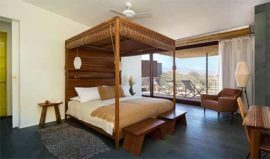 Featuring a bed with dossel (roll down shades), a frosted glass enclosed bathroom, an outdoor shower in addition to the indoor shower, private terrace and spectacular views of the Licancabur Volcano. Please note Oriente Rooms do not have bathtubs. These rooms can be set up with two twin beds or one king bed. Enjoy additional amenities including wifi, an outdoor shower, private terrace, central heating, air-conditioning, ceiling fan, hair dryer, and safe deposit box. 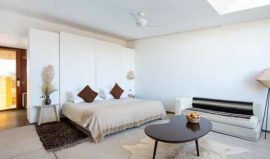 Poniente Rooms are slightly more spacious than Oriente Rooms, offering dramatic volcano views through large picture windows as well as views of the Salt Mountain range from the terrace. They feature a private terrace with outdoor shower overlooking the Salt Mountain Range and the hotel gardens. 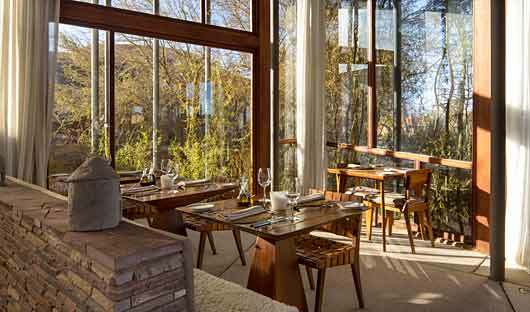 Poniente Rooms offer views of the Licancabur Volcano through large windows. These rooms can be set up with two twin beds or one king bed. Enjoy additional amenities including: wifi, private terrace, outdoor shower, bathtub, ceiling fan, central heating, air conditioning, hair dryer, safe deposit box. Family Rooms are ideal for larger families traveling together. Spread out over two levels and connected via an internal stair case, these rooms sleep up to 6 people with one master bedroom with a private bathroom upstairs, and two rooms each with two twin beds and their own bathrooms downstairs. A large private terrace upstairs looks over the hotel gardens. Additional amenities include central heating, ceiling fans, air conditioning in the master bedroom, safe deposit box, hair dryer. A fun excursion for the morning or afternoon. 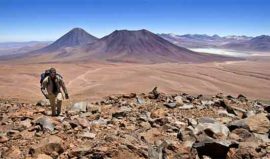 On arrival at the old road to Calama, the walk starts with a visit to some archeological sites and wonderful views of the volcanoes of the region. At a height of around 2,600m. /8580ft. descend via the huge dune to Death Valley an unforgettable experience! A morning or afternoon excursion. Depart the hotel by vehicle and head to Devil’s Canyon to start the walk. The altitude here is approx 2,450m. /8,038ft. We walk on flattish ground for about an hour, on the dry river bed through formations of lime which are part of the Salt Mountain Range. We continue along an ancient caravan route, passing by petroglyphs which show the former commercial activity in the area and finish at the old settlement known as Vilama. Return to the hotel by vehicle. Depart the hotel in a vehicle towards Guatin Valley (2,800m. /9,186ft). The confluence of two rivers takes place here; one coming from the warm thermal springs of Puritama, and the other is the Purifica River, whose waters are from the Andes Mountains. This unique mix of warm thermal spring water and cold clear mountain snowmelt gives rise to the new river which supports the unique ecosystem of the Guatin Canyon. We walk here, alongside waterfalls and rocky climbs whilst marvelling at the amazing Candelaria cactus. This excursion is better done in the morning because of the temperature changes. Starting at an altitude of 2,800m. /9,186ft. to the northeast of San Pedro, the walk is a steady uphill climb through the valley which is scattered with igneous rocks from the volcanic explosions of the past. We eventually arrive at the Puritama Thermal Springs, 8 pools of limpid warm water where there is a chance to bathe and relax before returning to the hotel by vehicle. This walk takes place at around 4,000m. /13,200ft. and is a great way to acclimatize to the altitude for people who want to climb a volcano during their stay. 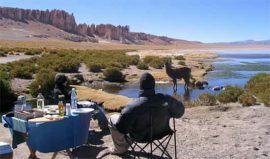 The walk follows the river bed and on the way we can see llamas, alpacas and local birds. Stop for lunch in the abandoned mountain village of Peñaliri. Following this break, discover the deserted teraces of the gully and continue on to the village of Río Grande, where typical vegetables are grown. Return to the hotel by vehicle. Depart the hotel by vehicle along the road heading to Calama. We continue through the Domeyko Mountain Range to the starting point of our hike (3,000m. /9,840ft. approx). We start along a small gully and then the hike opens up to large rock formations marked by petroglyphs. Following dry river beds flanked by mountains we admire spectacular views from various viewpoints. After a gentle climb-descent, we will finish at the Matancilla Valley, also known as Rainbow Valley. We will have lunch here before returning to the hotel by vehicle. 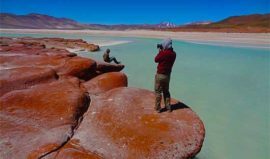 At an altitude of approximately 13,000 feet (4,000 meters), visit the remote lagoons of Aguas Calientes and the surprising salt flats of Tuyajto with its amazing colours and contrasts. 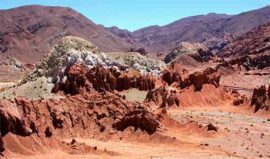 During this full-day excursion, we will also show you the area of Piedras Rojas (Red Rocks) with formations that seem to come from another world. Depending on the time of year, the ground salt may be dry and cracked, and we may spot foxes and flamingos. The colours of the altiplano stand out against the fierce blue skies and make for a spectacular panorama. Weather permitting, we will serve lunch at Tuyajto so you can fully enjoy the silence and spirituality of this remote place. If conditions are not clement, we will go to a simple restaurant in the small town of Socaire to learn more about their culture and to help support local small business. Heading east from the hotel, we travel towards the Argentinian border and the Salar de Tara. As the terrain rises, enjoy marvellous views of the Licancabur volcano and spot bird life, salt lakes and areas of marshland. At a height of 4,200m. /13,860ft. approximately igneous rock plugs form the “monks” of Tara, a wonderful sight in the middle of an amazing plateau. Continue to Tara itself, where lunch is enjoyed. 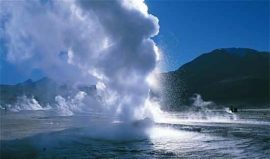 The Tatio Geisers are located at an altitude of 4300m. /14,190ft. The geothermal field has close links to the volcanic activity in the zone and consists of huge steam columns which reach heights of 12m/almost 40ft. Breakfast is served as dawn breaks. On the way back to the village, there is the opportunity to spot families of vicuñas and if we are lucky, foxes, vizcachas and Andean ostrich. We stop in the hamlet of Machuca before returning to the hotel by vehicle. The average temperature on arrival at El Tatio is -8°C (17°F) make sure that you take the appropriate clothing (gloves, hat, down jacket etc). This excursion is not suitable for children as the altitude will affect them. Machuca. Duration: 5-6 hours. Difficulty: Easy. To the north of San Pedro and reached by van via a steep road, is the tiny village of Machuca at an altitude of 4,000m. /13,123ft. 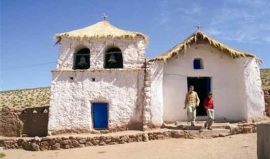 The village of Machuca has a privileged site surrounded by nature and in its only street we can see the roofs made of cactus and maybe taste barbecued llama, oered by the villagers. The church is of special interest for the cultural significance and birds and llamas can be seen in the area. This journey has established itself as a unique experience in an environment where water is an unexpected finding! Hidden at the bottom of a steep sided gorge, surrounded by vegetation, the River Puritama has 8 natural pools, with water which has an average temperature of 33 ºC /91ºF at an altitude of 3,500m. asl (11,482ft). Following a lovely bathe, we return to the hotel by vehicle. 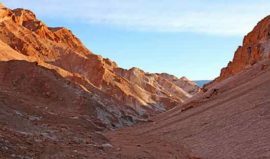 This journey allows participants to appreciate the surreal beauty of the landscape from many viewpoints in the Salt Mountain Range, such as the scenery of Death Valley, Moon Valley and the Andes mountain range. Includes short walks in areas with rocky outcrops, scenery formed by the wind the rain and the temperature changes of the desert. A must for photo buffs! 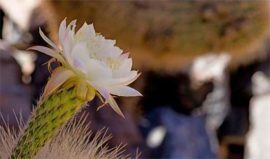 We offer this excursion in the morning, when there are less people in the area and our guests can enjoy the exclusive experience of the absolute silence of the desert. 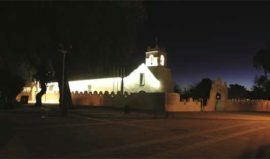 The journey starts with a brief visit to Toconao village where the square and the historic church are the main attractions. Also visit a local family who lives o the sales of their handcrafts. Continue to the National Flamingo Reserve in the Atacama salt flat. There are three types of flamingo to be found here, living o the microscopic lagoon life. The views of the Andes as the sun sets are truly amazing. 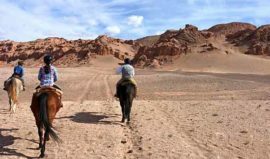 Atacama Horse Riding. Duration: from 2-5 hours. Difficulty: Rides range from beginner to advanced. We can arrange a selection of rides with Atacaman horses. Our saddles are Chilean (Western) style. 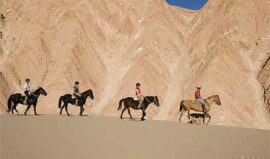 The horses are mounted at the hotel and we travel with our guide to discover the desert scenery. In keeping with our philosophy we work with a local small business for this service. * Chaps and hard hats are supplied in the hotel. Depart the hotel on bicycles heading north towards the Salt Mountain Range, and the beautiful Devil’s Canyon. The ride takes place at an average height of 2,400m. /8,000ft. After crossing the San Pedro River, we arrive at the Canyon, which is flanked by clay clis and has a sandy bottom in places. The ride is a constant gentle climb until we come out of the labyrinth on to the Catarpe plateau. The return journey follows the natural course of the San Pedro River until we reach the village and the hotel. A morning or afternoon excursion. Depart from the hotel heading northeast then head north towards the Salt Mountain range enjoying marvellous views of the Andes and volcanoes. Continue along the cornices viewing the formations of Death Valley from above, before descending via the old trails into the valley itself. Once at the bottom, continue on to Death Valley and cycle through the amazing scenery before returning to the hotel. The uphill and downhill parts are steep in places and this excursion gives a great workout! Bike Ride through the Ayllus / Atacaman Communities. Duration: 1.5-2.5hrs. Difficulty: Easy. Láscar. Full day excursion. Duration: 7-9 hours. Difficulty: Difficult. Lascar Volcano, Chile´s most active volcano, is a perfect spot for mountaineers. Leaving the hotel at 2.400 m (7,870 ft.) we will travel 100 km toward the South, passing by Laguna Lejía. We will arrive at an altitude of approximately 4.800 m (16,000 ft.), where we will begin our climb on the South face of the volcano until we reach the summit, which is at approximately 5.592 m (18,300 ft.) The hike is about 2 miles long, with an ascent of 600m (1900 ft.) Once we arrive, you will be able to see the volcano´s active smoke vents and multiple craters as well as a panoramic view of the Salar de Atacama and Laguna Lejía. We will start our descent gradually back along the same trail until we meet up with the van that will take us back to the hotel. Including the ascent and descent, we will be hiking for four hours. This is a full day excursion in an environment that is surrounded by amazing mountains and diverse plant and wildlife. To ensure there are no issues with altitude sickness, this excursion requires acclimatisation and guests are recommended to stay with us for five to seven days. Before participating in this excursion, guests must have completed at least one other high altitude hike. The journey starts from the hotel, travelling in a vehicle for 1 hour 30 minutes to the starting starting point of the walk at a height of 4,800m. approx (16,500ft.) The peak of the volcano is is at 5,650m. /18,645ft. and from the top there are great views of the Bolivian Altiplano and the Atacama Salt Flat to the west. After time for a break and a rest, the descent is taken slowly and safely down the same route until the vehicle is reached. Return to the hotel by vehicle. If time and the weather permits we can arrange more challenging volcano walks once Toco has been successfully conquered! 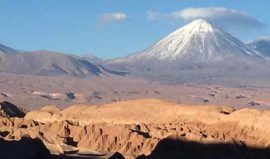 *Due to the extreme altitude and desert conditions in Atacama, volcano and mountain climbing are considered highly difficult. 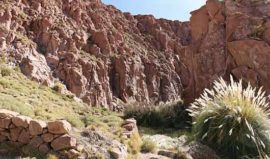 Tierra Atacama Hotel & Spa reserves the right to evaluate the risks associated with the guests´ physical abilities as well as the climatic conditions of the area before confirming one of these excursions. 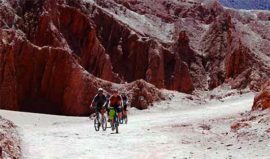 Tierra Atacama requires a minimum five night stay to participate in a volcano or mountain climb to ensure acclimatisation to the altitude and desert conditions, but at no time guarantees the execution of these climbs. 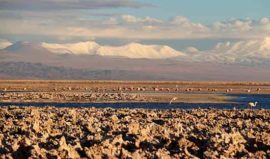 Places such as the Nacimiento and Guatin canyons, the Atacama Salt Flat and northern Chilean Altiplano are habitats which house a wide variety of differing species of birds. For example, the Salt Flats are home to the Chilean flamingo, Andean flamingo, Andean avocet and puna plover. The open altiplano wetlands house Andean geese, rufous-bellied seedsnipes, golden-spotted, ground-doves and ochre-naped ground-tyrants amongst others. Other species to be found in the area include the chiguanco thrush, cordilleran canastero, scale-throated earthcreeper, Andean negrito and horned coot amongst many others. 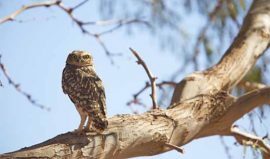 The time of year, migratory cycles, availability of food, temperature, altitude, etc., are all determining factors when bird-watching. The Altiplano is a huge plateau at an altitude of 4,000m. /13,200ft. It is an area of vast expanses of land cut into by deep channels and valleys, spotted with high salt lakes and where dark masses of lava from volcanic eruptions change the terrain. Rain is rare, temperatures vacillate wildly and the atmosphere at this altitude is transparent and luminous. 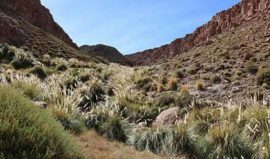 Although the conditions are harsh, many plant and vegetable species exist here and have adapted to the demands of the climate and terrain. Through vestiges of history and the occupation of the area, we can get an idea of what has happened here in the past. 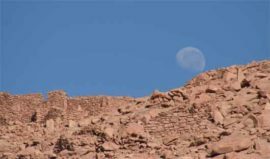 The idiosyncrasies of a people and their culture come to light in visits to the archeological museum in San Pedro de Atacama as does the visit to the “pukara” or fort of Quitor. Heading West, we take the road towards Calama and travel until we pass the village of Mantancilla. Here we will find the Rainbow Valley, which is part of the Domeyko mountain range. The range of colours in the landscape is incredible, with a variety of hues produced by the minerals in the area that have been exposed to various environmental and erosive processes. We walk for around 30 minutes in the area before heading back towards the area of Hierbas Buenas, where we will visit an ancient natural refuge, made of compact volcanic ash, and which was used by the local shepherds. 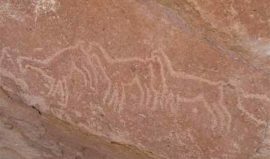 There are also many petroglyphs of great archaeological and historical importance, which we will view before returning to the hotel. Rupestrian art displays many forms of expression- man has tried to record experiences, common elements, symbols and signs. The description and understanding of them through the science of archaeology gives us the tools to understand. Petroglyph: an inscription or engraving on rock, fundamentally made by hand and with another hard object. These places are now in the middle of nowhere, yet once were important stops on ancient trade routes, they lie witness to the travellers, shamans and merchants of the past who converged here and left evidence of their stories. 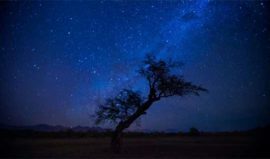 With César Anza, a native Atacaman, learn more about the indigenous cosmovision and the constellations of the llama and the fox, amongst others. From the observatory we can view the rings of Saturn, the craters of the moon, nebulas and supernovas, depending on the phase of the moon and the time of year. Full Moon at Tierra Atacama Hotel & Spa. Want to feel the true magic of the Altiplano? We’re delighted to present our special full moon experience. 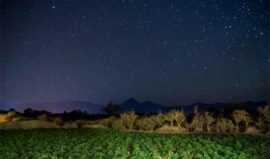 Choose from a night trek in the desert with moonlit shadows in Death Valley or or drive to the spectacular viewpoints of Moon Valley where you can try your hand at night photography. Head torches are supplied and the fascinating shadows under the light of the moon are strangely eerie in the silence of the desert. We finish the experience with a welcome hot chocolate. 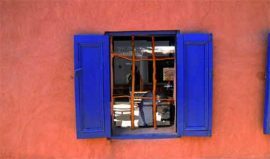 Follow our “insider tips” and then make some finds of your own for the best way to discover the history and customs of the rustic village of San Pedro de Atacama. See the ancient church with its cactus wood roof and enjoy the lively scene in the plaza. Pass through ancient wooden doors leading to hidden interior patios, many with open fires, and stock up on a wonderful selection of artisan wares. 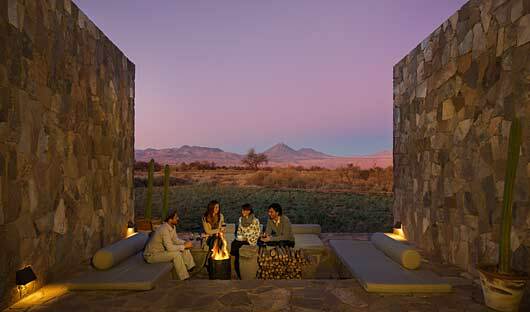 Before returning to Tierra Atacama for dinner, enjoy our invitation for a cocktail and aperitif alongside the locals. We can take you there in our comfortable vans, you can cycle to the village or if you prefer you can walk. 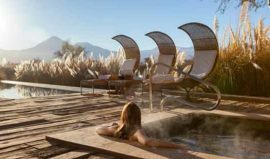 For more information on Tierra Atacama and to start creating your tailor made itinerary, call 1300 784 794 or email contact@satc.com.au.